Rosemary Ugboajah is the founder and president of Neka Creative, a brand development agency committed to bringing the power of inclusion to organizations through their proprietary process, Inclusivity Marketing™. 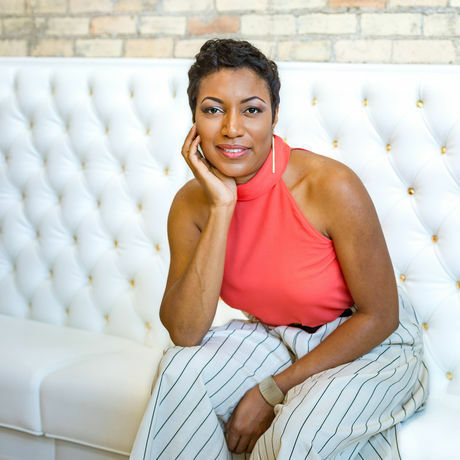 Most recently, she has led several strategic and creative projects building inclusive brands for clients such as: Merwin LTC Pharmacy, Penumbra Theatre, Swanson Flo, The Commons and branding the workforce system for the state of Minnesota. A testament to her zeal for excellence, her agency has won multiple communication and design awards, including ten Graphic Design USA awards. Rosemary studied art and design at West Kensington College of Arts in London and has a Bachelor of Arts in Advertising from the University of Minnesota. Rosemary currently serves on the board of Art Buddies, is a co-founder of ArtWest, and volunteers for a number of community organizations that focus on equity and inclusion strategies. Throughout its 87-year history, The Parkway Theater has brought generations together to experience everything from first-run features, to classic cinema, to live music. Following the first major restoration in 40 years, The Parkway will not only showcase classic 35mm films and live events—but become a regional cultural hub featuring world-class performing arts, comedy, and engaging speaker series. Passionate hospitality and craveable flavors fuel our communities. Blue Plate Restaurant Company includes Highland Grill, Groveland Tap, Longfellow Grill, Edina Grill, 3 Squares, The Lowry, The Blue Barn (Minnesota State Fair), The Freehouse, Mercury Dining Room and Rail, and Shindig Event Center. Since 2005, Kickapoo Coffee has worked to forge lasting, equitable partnerships with small-scale farmers. They work directly with coffee cooperatives and growers to ensure high standards for quality, sustainability and farmer compensation. Last year, they installed a 25-Kilowatt solar array at their roastery in Viroqua, WI, which provides 100% of the energy needed to roast their coffee beans. Stop by their cafe in the Third Ward to enjoy coffee, food and good cheer. Minny & Paul was founded with a vision to elevate your gift giving and make it easier to share high-quality local products. Featuring all Minnesota makers and brands in their pre-designed and custom boxes, they aim to make the gifting process thoughtful, easy, charming and with a true taste of home. Angel Bomb is a full-service graphic design and letterpress printing studio dedicated to delivering powerful messages. Our work is measured by its impact and we are committed to holding ourselves and our endeavors to the highest standards. What is the event like? CreativeMornings is about community and inspiration. Come for both! Registration will begin at 8:30am, and we’ll have coffee and breakfast ready for you. Coffee time is great for meeting the other CreativeMornings attendees. The talk will start at 9 followed by Q&A. We like giving high-fives. This Month’s Theme: Inclusive This month’s theme is Inclusive, chosen by our Grand Rapids chapter, illustrated by Libby VanderPloeg, and presented globally by WordPress.com. Parking? There is ample street parking in the neighboorhood. There is also a major bus line that stops nearby.